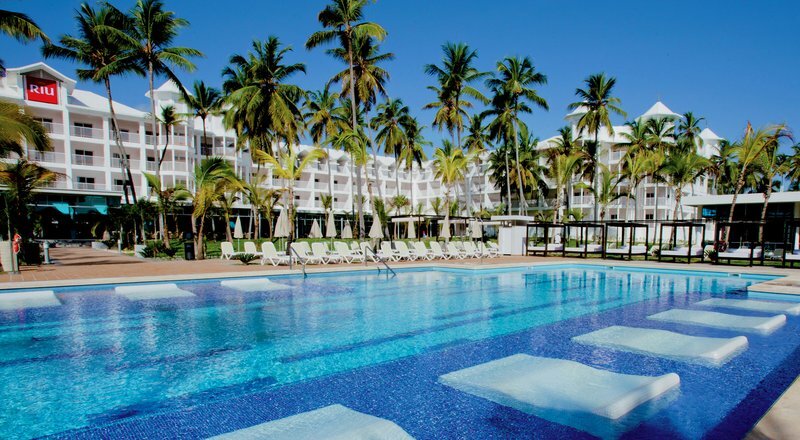 This adults only RIU resort is elegant and provides a relaxing atmosphere on a beautiful beachfront location, a paradise of palm trees and turquoise waters await you. Here you can enjoy a calm stay since the hotel will not have any children. You’ll find a fresh water swimming pool with a bar, free sun loungers, towels and parasols by pool area and a solarium-terrace. You will also find a gym, steam bath and the Renova Spa with a wide range of different treatments and massages. The All Inclusive system gives you the opportunity to try out various activities and sports such as table tennis, gymnastics, water polo, volleyball pool or beach, windsurfing, sailing, kayaking and much more. The “Copacabana” amphitheater will have live shows and live music for your entertainment along with the Pacho disco where you can dance the night away to the DJ‘s beats or you can go to the casino. The cuisine in the Dominican Republic offers a wide variety of dishes, with flavors and colors as dominant features on its plates. Dominican cuisine has received influences from African and Spanish cooking, and includes a wide variety of fruits and vegetables. In the buffet restaurant and themed restaurants you can sample the best recipes prepared by our chefs to satisfy any palate. The “El Pato” restaurant (non-smoking) with terrace, “Kabuki” Japanese restaurant (non-smoking), “Pancho” poolside restaurant / grill and steakhouse, “Volare” Italian restaurant, “Krystal” Fusion restaurant, “Cubano” lobby bar with terrace, “Capuchino” pâtisserie & ice cream parlor, “La Bohème” lounge bar with terrace, “Coral” poolside bar with swim-up bar are waiting for your arrival along with 24 hour room service. The 364 rooms have all been newly renovated and have a shower only in the bathroom, free Wi-Fi in the rooms along with a safe, mini-bar, liquor dispenser and balcony. Suites and Jacuzzi suites with living room sitting area are also available.